No. 15, last of three straight par-5s, overlooks the beach on the way back to the clubhouse. 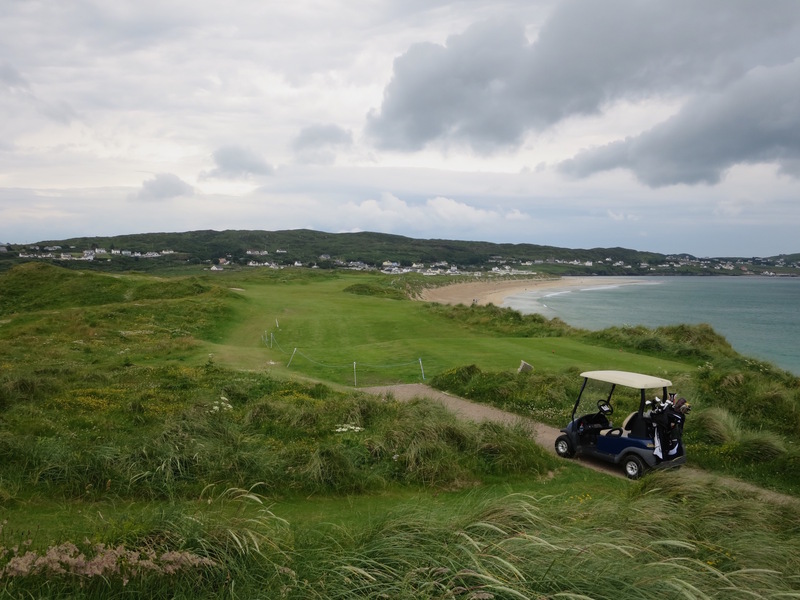 I don’t want to say we were saving the best for last when we teed it up at the Narin & Portnoo Golf Club. 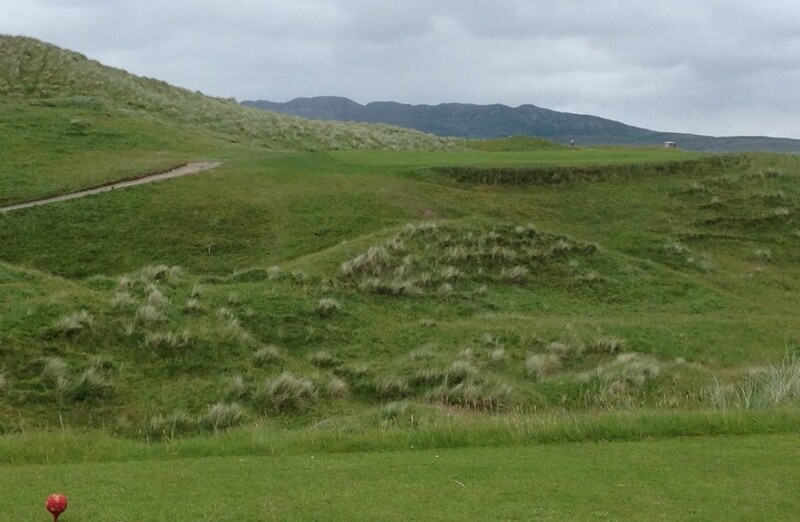 Each course we played on our tour of the north and west of Ireland brought its own attractions. Even if pressed, I’m not sure I could rank them. But I will say Narin & Portnoo was a delightful way to finish. And that’s true even though intermittent rain and wind often made the going difficult. Eighth tee juts out into the bay for a tough uphill drive. It’s a fun links filled with challenging whimsy. And even on a gloomy day, it was so scenic, sitting on rolling land that drifts down to Gweebarra Bay and then back for a nice view of its popular beach. 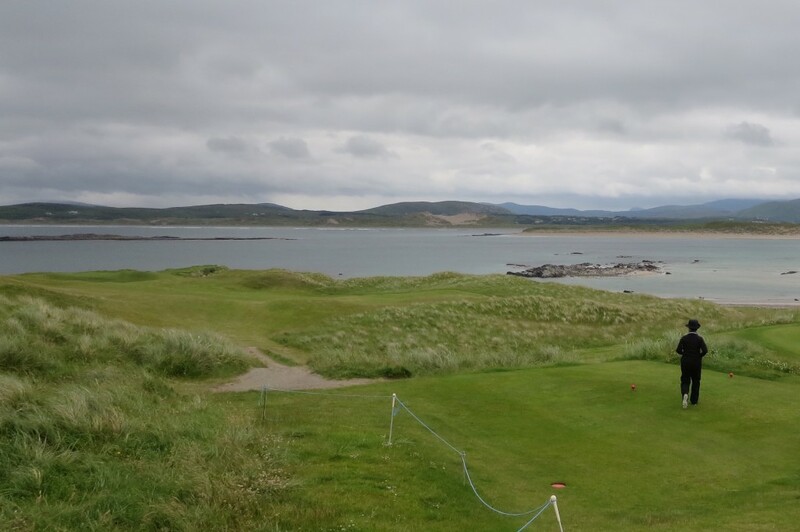 The drive from Rosapenna to Narin & Portnoo—the club is named for two adjacent towns—was another exercise on backroads, which meant a 45-mile trip took 90 minutes. But it was a picture-postcard drive through rocky pastureland, and the narrow but uncrowded roads were pleasant. The skies were dark when we pulled into the carpark, but the modest clubhouse looked inviting, and so did the course. The first hole was a good version of the typical British Isles links starter—a short par four with a creek guarding a green sitting up high. With the green not in full view, that approach was visually tricky for first-time players. There were more blind and semi-blind shots to follow. I’m sure I’d do some things differently the second time around N&P, if my swing cooperated. But that’s one of the appeals of Narin and Portnoo. Another issue I had was gauging distances. My beloved Golfshot app, which had worked amazingly well in both Scotland and Ireland–had just disappeared due to a massive “update’’ that essentially created a whole new app—and it was basically useless to me that day. I still much prefer the old version, and I have made that point to the Golfshot people. But that’s a rant for another day. Don’t be short on the par-3 7th. What this meant was that I had to rely on the local distance markers. They measure in meters to the front of the green. My bad for not studying the yardage (meter-age?) guide. But what this meant was, the red marker–which signals 100 yards to the center of the green back in Chicago—now was saying 130 yards to the center of the green. I figured that out on the 18th hole. As a result, I sprayed a little bump-and-run into the hazard behind the green of the par-5 second hole. Didn’t even know there was an irretrievable hazard behind the green. But no worries. I always accept the perils involved in lacking local knowledge, or even yardage ignorance. The opening holes at Narin and Portnoo are straight-forward—a nice touch for visitors. Things really start to get interesting, though, on No. 5, an uphill dogleg left with huge, intimidating undulations right in the middle of the fairway. No. 6 was even more of a puzzle. With water on the right, the No. 6 tee shot clearly had to go left. How far left? Let’s just say, that was a mystery to me. No. 8 dives down to the water from its elevated tee. No. 7 is a par-3 over a no-man’s land where the meters-yards calcuation was essential but not easy. Mix in the confusion about the distance to-the-front vs. distance to the middle of the green—and I was really cursing Golfshot for choosing that exact day to implode my trusty yardage device. But again, no worries. Narin & Portnoo was way too fun. The eighth hole was a major downhill joy ride, even if the big valley in front of a wind-blown green was another complex geometry problem. By the time we got to the ninth tee, Liz and I were sold. The No. 9 tee juts out into the bay on three sides. The tee shot is virtually straight uphill—right over the eighth green—and there are two sticks at the top of the hill marking the line that should be taken. Playing into a fierce wind, I stopped short of the left marker-stick. What a treat. When we finally climbed the hill, we saw that the hole was a dogleg right, with little islands of fairway surrounded by all kinds of hazardous terrain. Approaches brought in from the left on No. 14 will kick back toward the hole. Each hole was a mysterious marvel. No. 10 was an epic par-5 into the wind. That was only a preamble to the back-to-back-to-back par-5s on the 13th, 14th and 15th holes. Given the wind, I was wondering whether we would be able to finish this march back to the clubhouse. I need not have worried. Unlike No. 10, the other three par-5s on this par-38 back nine were not as taxing. No. 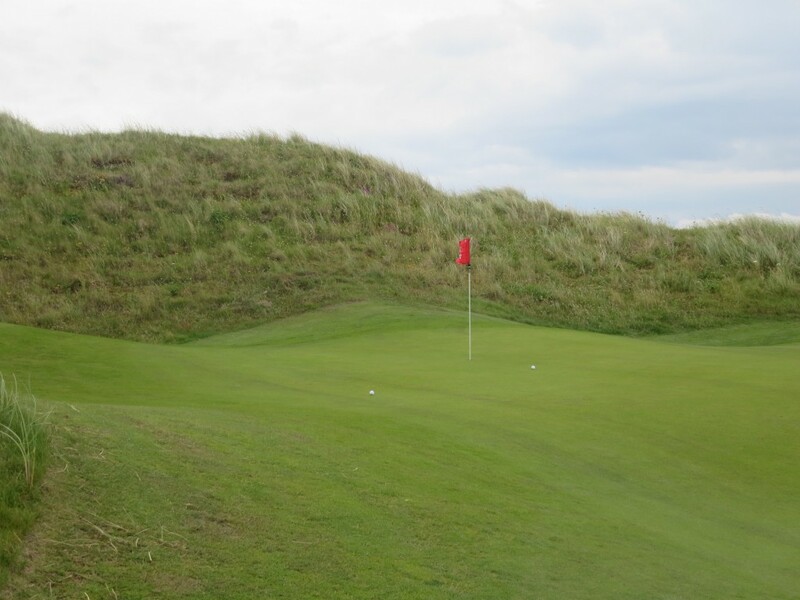 13 was a compact 460 yards, and wide enough to diminish fear of the wind. While narrow, the sloping fairway of No. 14 sneaked back downwind. And No. 15, which also was narrow, played short enough to keep an alarming set of bunkers that came into play on the approach to the green from being overly menacing. The final three holes—a short, wind-blown par-3, a bumpy-fairway par-4 and a nice mild dogleg—were equally exhilarating. This was an enchanting 6,000-yard journey—or should I say, 6,000 meters? For all the miscues, for all the wind and rain, we walked off the 18th green smiling. 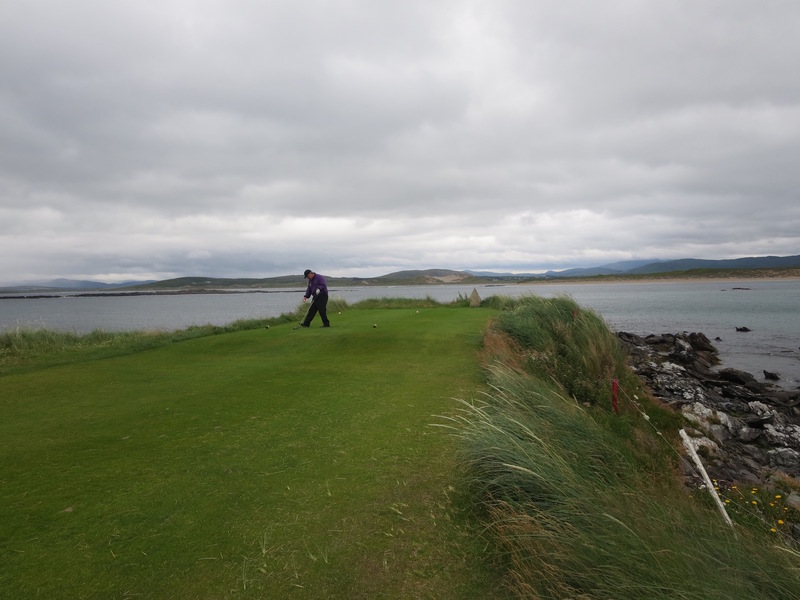 This is the kind of golf we come to Ireland and Scotland for—unpredictable, natural expeditions next to the sea. The clubhouse was equally inviting. As we drank our pints, we watched the rain step up in intensity. And when some hardy souls teed off on No. 1, oblivious to the weather, we understood why. Please click on photos for an enlarged view.